There is a fine line between insanity and genius and the Heaviocity team has managed to find it and package it as a fantastic library. DAMAGE is an interesting and yet a touch bizarre offering from the Heavyocity team and Native Instruments. The library combines a series of percussion loops where traditional drums and other sound sources are marred, torn, ripped, broken or otherwise manipulated and put into kits, including some performed by drum maestro Mike Mangini. The Heaviocity team went to some strange lengths to provide us with some really interesting and bizarre sounds, for example the Heavyocity team sampled sounds in a Connecticut junkyard where they inflicted some serious damage to cars and even managed to drop and record the impact of a falling bus! 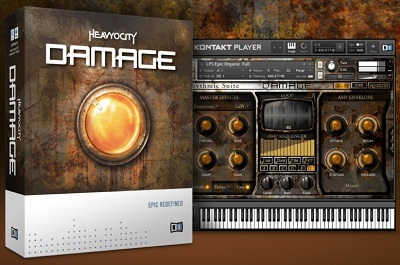 DAMAGE is formatted for NI's Kontakt virtual instrument and its lite free version, the Kontakt Player.According to Heaviocity, the sounds of DAMAGE come from loops, kits and effects. The kits are loosely classified as “Epic Organic”, “Epic Tech”, “Industrial” and “Mangled Pop”. There are loop menus and single loops included in the package. Loop menus are matched loops, mapped across the keyboard and could work for when you need quick tempo synced grooves. The individual loops or single loops, allow for further tweaking, where the user can change pan, tuning and other effects in real time by using key triggers to further enhance the sampled sounds. DAMAGE offers 58 multi-sampled drum kits from more than 200 deeply sampled percussion sources and over 500 individual single shot elements. Effects could then be added to all the above options, by applying them globally (Master Effects), triggering performance effects (Trigger FX) or by tweaking individual sounds. The Master Effects control distortion, reverb, delay, drive, etc. Installation is a mammoth download of about 30GB, which in retrospect would've been easier to purchase on DVDs as the download cut off several times over on standard home DSL connection. I had to complete the download over at work at faster data speeds. The download is of several parts as the Kontakt Player has to be also installed in order for DAMAGE to work. Validation is done via a challenge/response scheme which worked fast and it validated me against my NI user account. Lots of data to install is understandable, given the size of the collection so it takes a while to copy all the samples onto your hard drive. Most manufacturers are selling downloads nowadays, but for this one I'd much rather take the physical media option. After rescanning my VST installation folder to recognize the new install, Studio One happily found and loaded Kontakt Player, which is used as interface for DAMAGE. I loaded some of the default loops and I was instantly transformed into industrial heaven. The sounds on this library are huge, and as far as I know this is probably the most ambient and cinematic industrial library that I've listened to. I could also recognize the sounds used in a few cinema productions and video games as coming from this library. Tweaks were overall self explanatory and I was on my way to making some seriously mangled industrial pieces. I found Kontakt Player to be somewhat an uphill battle as I like to place loops by dragging them directly in the timeline in Studio One and this software does not allow for it. You have to trigger from a midi note which then restricts the options for quick editing in a familiar interface, which for me would be the DAWs midi editing facility. I am told that the full version of Kontakt allows for this but unfortunately, it is an added cost, so as far as loop editing is allowed, it can only happen inside the Player for those that do not have the full version of Kontakt. The midi loops could also be found by browsing the installation folder but are not properly named and finding the one that corresponds to the one currently playing is next to impossible. With that in mind I quickly moved over to using my previously created drum loops for Impact (Studio One's built-in virtual drum sampler) and EZDrummer and proceeded to trigger DAMAGE from these. I found the drum kit samples especially useful for triggering kick and snare samples that then augmented and brought impact and weight to my standard EZDrummer kits. The already existing loops could provide a quick approach to cinema production, but Kontakt Player proved cumbersome to my production approach and I have to honestly say that I felt that I was constrained by its limitations. It might be the fact that I am more hands on when programming my midi and use loops which then are edited somewhat to fit the performance better. Most of the music I work on comes in the form of guitar riffs and the drum parts have to be written to work with these. I managed to create some very interesting industrial and dance textures, especially by using damage as a drum kit, triggering from an Alesis midi drum kit or from my midi keyboards. Overall I am very impressed by this sound library. The cost is somewhat prohibitive and aimed more towards the pro market, which hopefully will also have a full version of NI Kontakt as the free player seems limited for some functions. Heavyocity is strongly recommended for those producers looking to add something unusual, different and interesting to their production. Great for industrial music, cinematic impacts or video game design. There is a fine line between insanity and genius and the Heaviocity team has managed to find it and package it as a fantastic library.